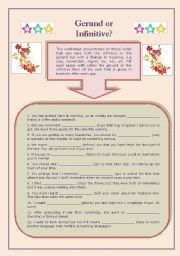 Three different exercises: fill-in, multiple choice and combine the sentences. This WS contains 3 different exercises - 2 exercises use the past simple tense the third one, asking questions (dialogue) also includes present simple & progressive. 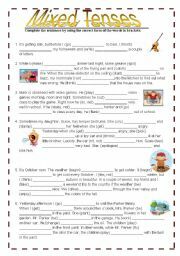 A two page worksheet on the three types of conditionals. Includes a fill-in exercise and a rewrite (transformation) exercise. A nice ws on mixed tenses. Enjoy! These are two exercise (fill in) using active and passive verbs - basic tenses (Present Simple/Progressive, Past Simple/Progressive and future). 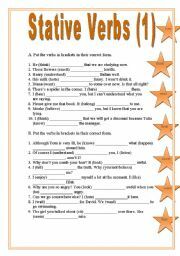 Two exercises using stative verbs (non action verb). This relative clause WS includes 28 multiple choice sentences. Gerund (-ing) or Infinitive (-ed)? 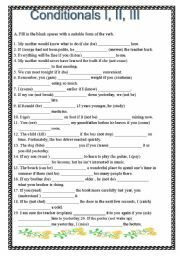 This worksheet concentrates on those verbs that can take both the infinitive or the gerund but with a change in meaning. e.g stop, remember, regret, try, etc, etc. Fill each space with either the gerund or the infinitive form of the verb that is given in brackets after each gap. It also includes an answer key. 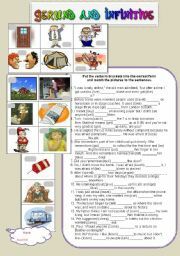 A WS that deals with gerund and infinitive - a fill in exercise and match the picture (comprehension). 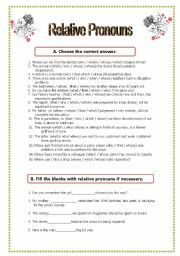 It includes explanations, examples and exercises on Relative Clauses. A Powerpoint presentation on the Past Progresive VS Past Simple - suitable for intermediate and up. It includes the sonnet and a translation to modern English. 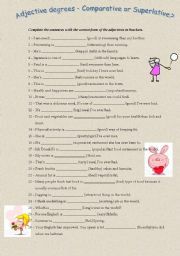 It includes explanations , examples and exercises on Gerunds and Infinitives. Sentences have to be combined to avoid the boredom that would happen if all sentences were the same length.